Below is a great link to an interactive graph. It is a great look at the nationwide home sales for September 2017 that you can breakdown by region or state that is provided by the National Association of Realtors. Here is a great video on the current conditions from the Kansas City Regional Association of Realtors covering what is going on in the housing market and why. 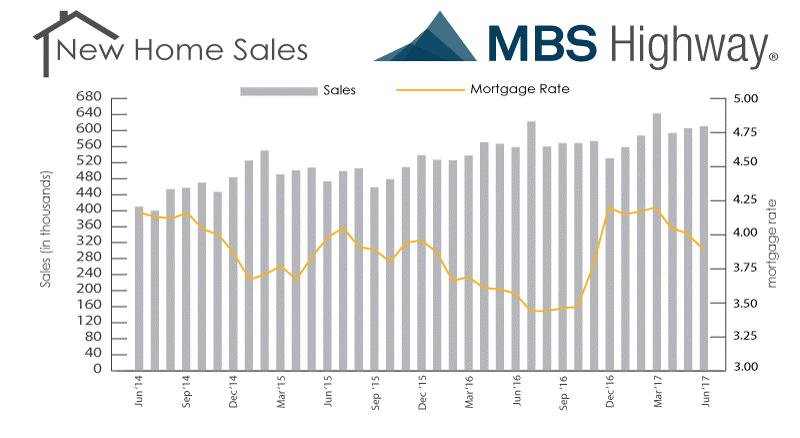 New Home Sales, which measures signed contracts on new homes, were up 0.8% in June at a 610,000 unit annualized pace, which was pretty much in line with expectations. Last month’s figure, originally reported at 610,000, was revised slightly lower to 605,000. Keep in mind these are National stats. Inventory levels rose 1.5% to 272,000 to their highest level in 8 years, but they are still about half of what they were 10 years ago. Even with such tight inventory, Sales are still up 9.1% on a year over year basis, which is stronger than last month’s 8.9% reading. The Median New Home Sale Price was reported at $310,800 was actually down 3.4% year over year after setting a record high last month.